Anyone in the technology rental industry knows how important it is to be the first to the market with a new product; especially one that will get your message across with a bold image, a video or a live broadcast. That is where ABCOMRENTS comes in. Not only are we constantly bringing the most current models into rental inventory, we are also searching for the next innovative and amazing product line! This is what makes us stand out from other rental companies and is why we continue to grow partnerships with every single client. By now most of us know how awesome video walls are and how much they can change the trajectory of a business. 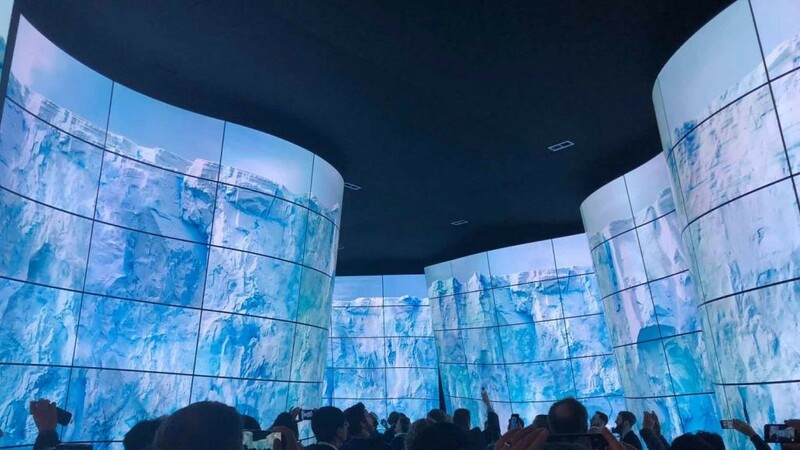 Video wall rentals are becoming more and more common in all sorts of stores, educational facilities and corporate settings around the world; but with technology changing faster than ever imagined before how do you continue to stand out or be more innovative? FLEXIBLE video walls – THAT’S how! Our LG 55″ OLED Flexible Display Rentals are bendable, lightweight panels that can be custom bent to concave or convex formations and put together into a video wall without any picture quality loss! The possibilities and combinations of sized wall rentals are endless. The flexibility in these displays can transform the simplest idea into something truly magical! For example, a cruise line has used our OLED display rentals to create a tunnel of outer space; change the video or imagery and instantly have your audience under the ocean, flying through clouds, walking through your store headquarters and more!